Fully automated Torch Expert Advisor. Trading is performed using pending orders on important price levels, where price has stopped in previous periods. Two-levels adaptive TrailingStop for accounts with floating spread. Trading can be performed either with fixed lot or with automatic money-management system. The minimum deposit - $100. Trading on EURUSD is recommended. 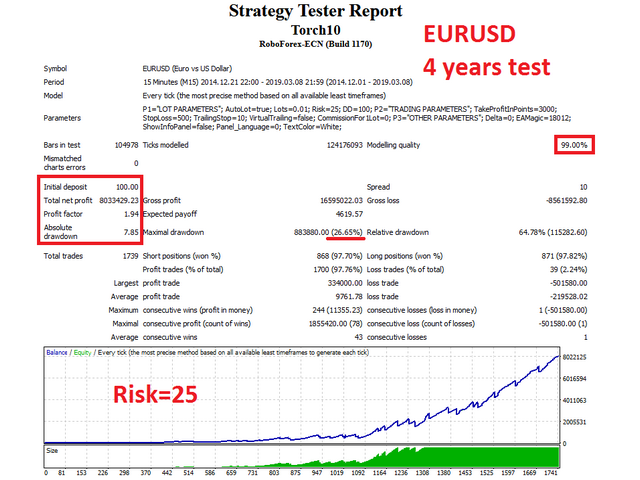 Risk - maximal risk on one order, if AutoLot value is true. DD - the maximum allowed drawdown. If reached all positions of this currency pair will be closed. TakeProfitInPoints - take profit in points. StopLoss - virtual stop loss in points, if AutoStopLoss=false. VirtualTrailing - can be set to true or false. If true, the EA hides the modified StopLoss levels from the broker. CommissionFor1Lot - broker commission for 1 lot, in the deposit currency. If your account does not have a commission, set to "0". Delta - indent from important price level for pending orders. EAMagic - "magic" number of the EA, which allows it to distinguish its orders. 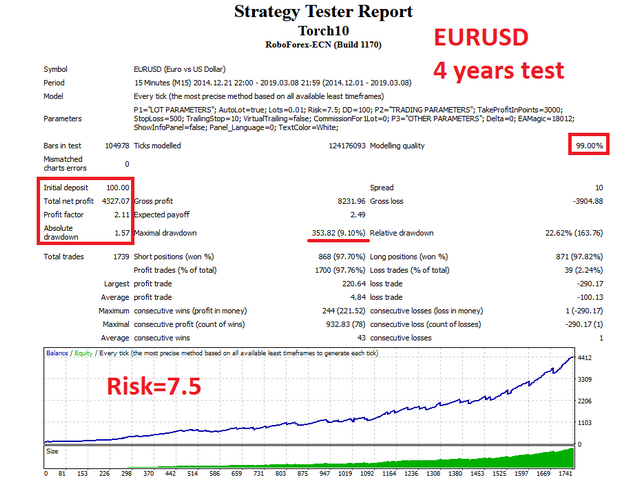 Recommended settings for EURUSD are set by default. Price of the Expert advisor will change every week proportionally to profitability of the signal Monitoring of trading by Torch EA . This system is the worst.